These guys belong to a friend of mine who has had me do a substantial amount of work for him. They are part of his DIY Space Marine Chapter. In this case, it was two dreadnought torsos and eleven arms so he could mix and match them as needed. I talked about the work that had to be done to one of the dreads in my previous post on magnetizing them. Here you get to see how they look all painted up. I added the detail to the torsos and not the arms for this project because I didn't want to end up with arms that were detailed but didn't look right on the model. Keeping the arms clean and focusing on the torso allows my Client to mix and match without having to worry about how the dread looks on the field. The bases are from Secret Weapon Miniatures and are part of the Flagstone series. This is the same line we used in the Storm Wardens project. Once they were released in beveled edge, I was sold. I painted them to match the rest of the army and added static grass on the portions of the bases that would normally have moss growing on them. It was the perfect outline for me to follow. This guy was painted up and I stole the front panel idea from the GW site when they posted the new model a while ago. They had one version with the front panels white and weathered. I loved the look of that model and tried to do the same thing here. The weathering is subtle and I think that's what I like most about it. This guy was rescued from certain doom. Now that he's all painted up, he looks a little more battle ready. I like the wings on the sides, they aren't something you see often unless you're using a Forge World dreadnought. A simple solution with nice results and that's a win by my standards. And this pic here... I'm stepping up my painting. A huge thanks to John at Santa Cruz Warhammer and Justin from Secret Weapon, these two guys have got me using higher quality brushes and it makes it much easier for me to get more and finer detail on models in the same time I would have spent on them before without all the detail. In the examples above though, it's more about variety. When you're painting 11 arms, you try and make them a little different. 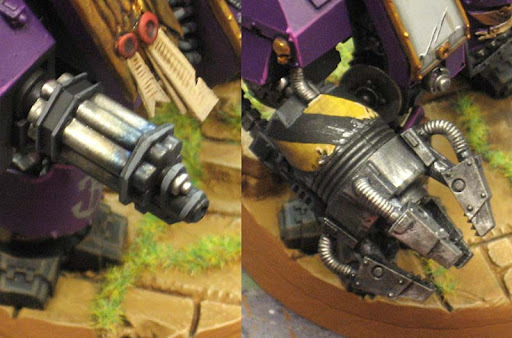 I've decided to alter the way I paint my assault cannon barrels now. Instead of the standby "soot stained" look, I've moved up to more of a heated metal look. A combination of the Asuremen Blue wash followed by Gryphonne Sepia gives the metal that color range it gets from being heated. The caution stripes were a must have on the other arm. This thing (and I don't even know what it does exactly) just looks dangerous. I figured the caution striping and some battle damage would make this arm look even more imposing. Fantastic pair of 'noughts you have there. I love the variation you have in all the different weapon arms. 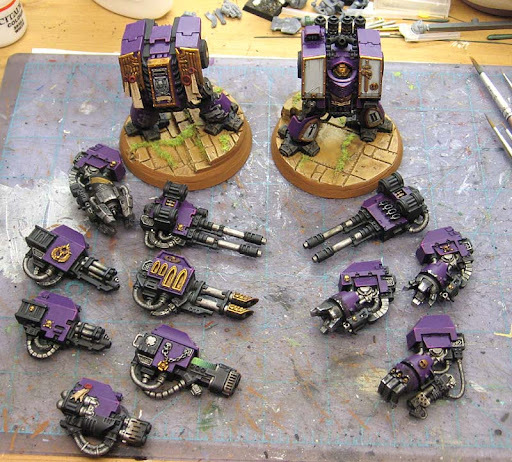 Is the left dreadnought the Black Reach model? Did you mount the resin bases on top of normal plastic ones? GDMNW: Nope, they are just built up like that. It gives them a little bit of additioanl height as well. The metal flashing and caution stripes are awesome! I've been doing both lately myself. I use Leviathan Purple instead of Asurmen Blue, but it gives the same tempered effect. I like the golden shine to the back - what colors did you use to get that? With the caution stripes (which I use on my Blood Angels power fists (http://redangels.bagosy.com/files/2010/09/8-5_2.jpg). I start with a base of Iyanden Darksun, then build up with brighter yellow shades. Once the whole thing area is yellow, I mark out my stripes with a micron pen to get the sharp edge, and then fill in with Chaos Black and do the standard edge highlighing. Paul: I think the shine on the black is just the lighting. I do my caution stripes the same way as you minus the micorn oen in this case. I also really like the fact that the new brushes are helping you really improve the painting. On another note though, could you perhaps tell me what 'expensive' brush you are using? I'm currently looking around but I find it very difficult to choose. So what brush did you receive? Because I find it hard to search for the brushes with 'reservoirs'. Beautiful work, but I actually wanted to drop a comment asking for a paint brush article. I use the same old brushes rather than my expensive sable one... because I'm terrified of using and ruining it! I don't know what I'm waiting for. Ash: These are for a friend of mine, They are part of a much bigger commission I've been working on for him for a long time now. Dennis: I can tell you exactly what I use now. While it might seem like I'm pushing his products, I have to confess, I use a brush that misterjustin sells through Secret Weapon Miniature. You can shop around or just get it from him for the convience like I do. It's a Raphael 8404 Kolinsky Size 0 (Zero). When you look at it, you'd never think it could paint details like it does. It outperforms and has outlasted the previous kinds of brushes I used to use. I can tell you I am getting another one for Christmas as a backup, but the one I have now is still in top shape even after a month or so of serious painting by me. Misterjustin might chime in here and be able to provide some more help along the line of brushes. I am not an expert on them just yet. Brent: Get a good one and start using it. The only thing I don't use my good brush for is laying down base colors where I just need to slop the color on. Other than that, it gets used for everything. As for an article, check this two part series out: Brushes. It was a huge help for me. Ron, thanks allot for that information. I want to push my painting skills as well and I was looking for some 'belly' brushes. However with all the products on the net I could not even come close to a decision. As I follow your blog quite frequently and seeing you absolutely love the new brush I just had to send you a message. If you recommend it than it has to be a good product! I think I will stick with the 0 for now. I need to try such brush to improve the finest details! Might even be the push to get back to my blog as well..
Again, thanks allot Ron. Give a shoutout to misterjustin as well, I'll be sure to visit his shop. Dannis: I was there as well. No idea what to get that would help me out. The article helped me and then John from Santa Cruz Warhammer sent be one of the brushes he uses (similar to the Raphael brush) that got me started. I would definitely pick one up. They aren't the brush for a "beginner" though. I say that because I think a painter will need to have an understanding of how to use it best to get the most from it. I went shopping around to look for cheaper prices, but like everything else out there, most things are close enough in price that it comes down to buying from someone you trust. Well I just ordered them, together with a pigment and the winterkit. I'm excited to see what the brushes and the kit will do. The main reason for the brush will be the freehand I guess. Just like you said somewhere, I get some trouble with painting freehand designs and the 'thin' brushes, so I hope this brush will help me to expand my skills on that. Once again, thanks for helping a fellow hobby-er! Dannis: It will help with freehand. It helped me get better results in a shorter amount of time. I actually can get finer detail into smaller areas with a little bit of work with the "better" brush. And there's the order, sure enough. Thanks! Ron, I love that you went for the hot metal look. It's great. I have some tips for good hot metal I'll try to put into an article as soon as I have time to breathe again. Also love what you did with the Flagstone bases. I appreciate the plug for the product and it's great seeing what you do with it. They came out extremely well. The colouring is very unique which should help set them apart on the tabletop. 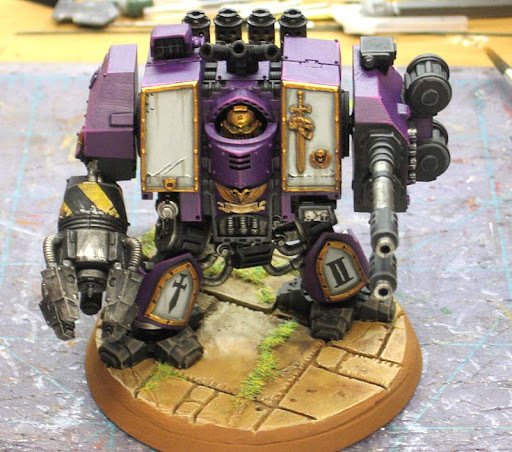 I don't understand magnetized dreadnought arms. 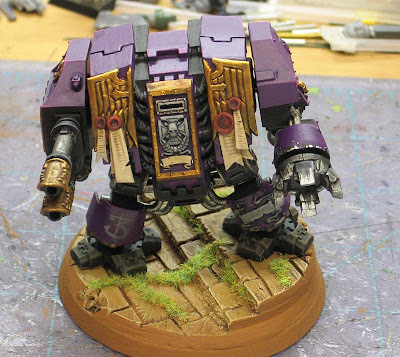 my dreadnought is magnetized to his base and at his torso and the engine on his back, but I've never magnitized the arms. they come off so easily. why do they need to be magnetized? Diaord: It's to allow you to change out the different arms easily depending on what kind of dreadnought you'd like to field.